To obtain high profit on voice traffic termination it is important to reduce business expenses. One of the essential cost items is the Internet required for the equipment operation. In order for the gateways to operate without failures, it is important to ensure the Internet speed of at least 2-5 Mbps. But how much will it cost to locate the equipment in Senegal? 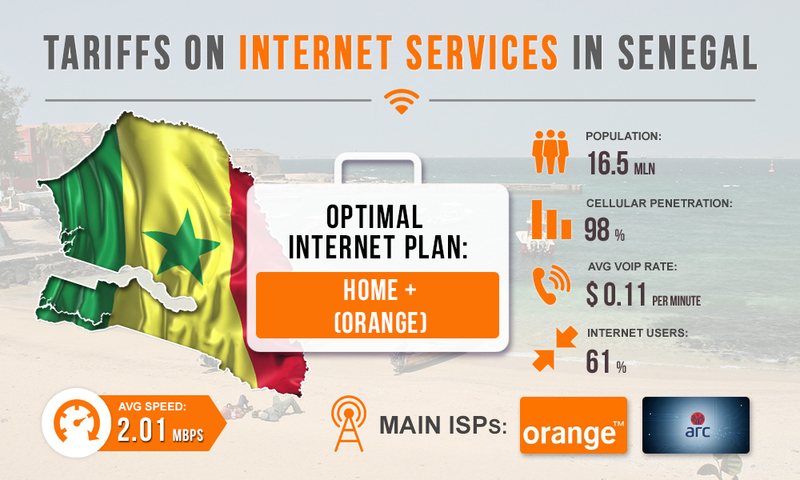 The Internet services segment in the telecommunications market of Senegal had been poorly developed until recently. This is due to the poor state of fixed-line networks and the Sonatel monopoly on the fiber-optic Internet. In the DSL sector, about the same thing used to happen: the lack of competition had a negative effect on prices. In 2018, new players entered the market, which contributed to competition and lowered the prices for Internet services. Orange (or Sonatel) still remains the leader in the Internet market. It provides access to fiber optic and ADSL Internet. Fiber-optic Internet is considered the most suitable for traffic termination due to the signal stability. You can choose Home Fiber to operate the gsm gateway voice with a large number of channels. If the equipment with the minimum number of ports is placed in one location, you will be OK with HOME + package performance. With this Internet plan, you will spend $52 a month, with an average earning of at least $300 from a channel.